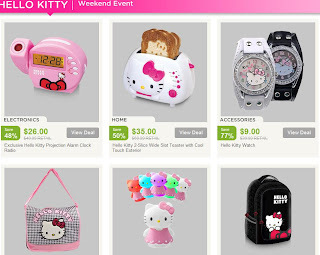 Do you know that nomorerack sells a Hello Kitty deals this weekend? There still lots of time to shop at their store specially there are things you might want to buy for your little girl. Many girls like Hello kitty stuffs and am sure they also like pink colors. There are many to choose like watches, bags, kitchen stuffs, electronics and many more. Click the image to register and start shopping with the lowest price ever. I want to know if your first year consist of full time work considering that you still have to do more training or do you immediately go to the one weekend a month? can you work full time? i love hello kitty! thanks for this!